Mood board by Alice Goldberg Wildes. A lady after my own heart. I approve! I stepped into a little piece of heaven when I walked into Mendel Goldberg last Sunday and saw bolt after bolt of the most glorious fabrics not only in New York, but in the world. Greeting me at the door was a fabulous inspiration board put together by Alice Goldberg Wildes, great-granddaughter of the store’s founder Mendel Goldberg, and after that there were fabrics that will make you want to sew even if you’ve never picked up a needle in your life. The inside of the restored Mendel Goldberg. So much to love. How do you choose? Mendel Goldberg, on New York’s Lower East Side, reopened in April 2013 after a devastating fire last year forced the store—open since 1890—to temporarily relocate to Broome Street. For all you DIY Chanel jacket sewers out there, you know Mendel Goldberg is a great New York City resource for European bouclé and of course I fell in love with more than one bolt. These two are the winners but I have to think about it and ask myself: Am I a good enough sewer to step up for pricey fabric even though this will be my first attempt at a jacket of this kind? My jury is still out but feel free to weigh in if you have an opinion on this subject. This is black bouclé with paint-flecked ribbon woven in. This is midnight blue bouclé with black Lurex threaded throughout. It is gorgeous! You can find the fabrics to make this Valentino dress ($3,490) right now at Mendel Goldberg. This has to be one of the most inspiring stores in all of New York City so even if you don’t sew and have no intention of ever learning how, you ought to visit this landmark shop if only to get a sense of what it must be like to be in a designer’s atelier surrounded by yards and yards of breathtaking beauty. My most favorite of all fabric stores ever. I purchased the black boucle with the metallic thread, and I start my jacket next week. Go for it. You will feel honored to sew this fabric, that in and of itself, will force you to finish it! I'm not sure if it's possible to reblogg this, but I will try, as I know a lovely lady here in Vienna, who really knows her sewing stuff!!! I love that midnight blue, though I imagine it would be hard to find a fabric there that is not lovely. I found it....and by phone also! Alice was wonderful and sent some swatches. I wanted basic black with a very small twist ie the metallic thread. If I am going to spend 70 hours making it- I want to wear it forever! They had some a month ago..... you will fall in love with it. I start on it tomorrow! 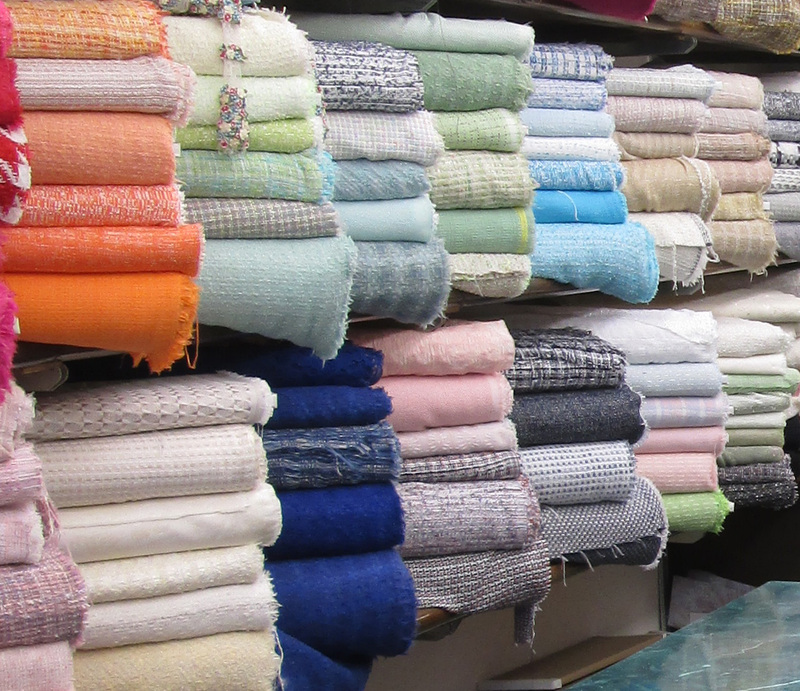 My mother has always been a quilter and seamstress, so I spent a lot of time in fabric stores as a child. I would move from bolt to bolt swishing the fabrics and wrapping them around my little body just to feel the tactile pleasure of it. I never was much of a sewer and gave it up as a teen, but I do still love the beauty and pleasure found in a fabric shop. That inspiration board is tres beautiful. What a fantastic shop with the finest of the fine in fabrics. My sister was a head designer for St. John Knit for 21 years so I have definitely grown to appreciate the fine fabrics and trims.